Eventador Fully Managed Apache Kafka is a simple, secure and fully managed Apache Kafka platform. Contact sales for a trial account and/or demo. They will give you a dedicated URL and environment for your use. A topic is a container to hold a stream of related data in Apache Kafka. 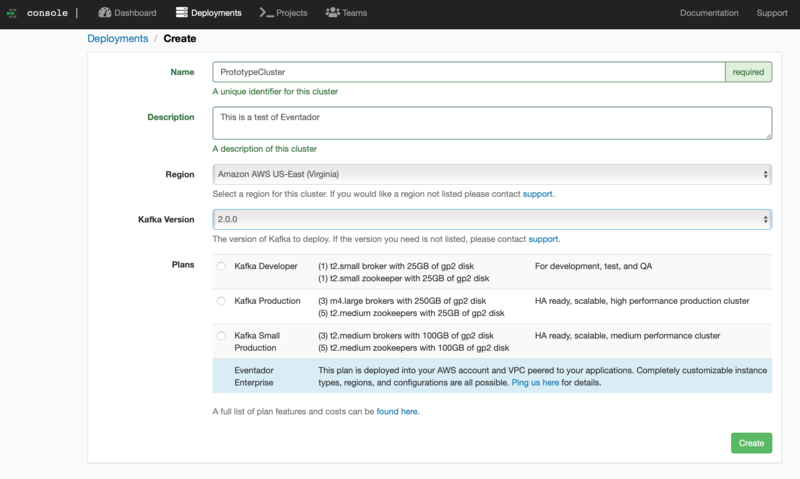 From the deployments list - Click the Apache Kafka link in your deployment. Name the topic demo and set the number of partitions to 16. Replication factor is set to 1 for development cluster but can be increased in production deployments. Congratulations! You have setup a new Apache Kafka cluster. Now that your topic is created you’re ready to start sending data. Here is an example of producing and consuming data from your Apache Kafka deployment with Kafkacat. Type the name of the deployment into the Delete Deployment box. NOTE: This operation can not be undone and is permanent. Clusters are scaled by adding brokers of the same instance type as the other brokers. Additional brokers are assigned an AWS availability zone based on a simple round robin algorithm. Click the Add Brokers button. Input the new number of brokers you would like. Currently only scaling UP is supported. Click Add. The brokers will be added in the background. NOTE: This is an online operation. Existing topics will not be rebalanced across new brokers. If you would like to rebalance topics, contact Support. New topics will automatically be partitioned across the new brokers. From the deployments list - Click on your deployment name - in this case PrototypeCluster. Click on the Apache Kafka link. Copy+Paste the Plain Text Endpoint value into your applications. Optionally, SSL/SASL endpoints are also exposed. There are code samples on how to use them with popular languages. NOTE: We highly recommend using SSL connections. Use this connect string in tooling that requires a Zookeeper connection.